So I know I've been a crumby blogger but here is a little review since Phil's birthday... NOTHING! We have been either studying, sleeping, eating or at school. I'm on my last year and it is getting pretty intense especially from only seeing 1 patient a week last year to 7 a week! I know to those of you who are dental hygienists or to just Shawneen that doesn't seem like a lot but it is to us little students! 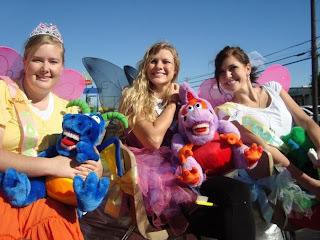 The only thing that is pretty cool is that I was in a parade last weekend! Beeville puts on a little parade for "western week" (which I thought every week was western week here but anyways...)and our college volunteered the hygiene department. 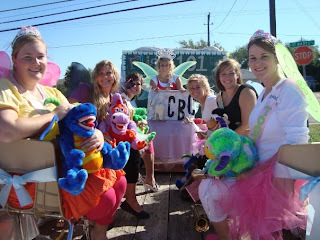 We made our float look like a classroom with a blackboard and stuff and we were toothfairies! It was pretty fun, so I'll post a few pictures of that. Oh and since its been so boring here I decided to dye my hair...again. poor Phil probably thinks I'm going through some kind of midlife crisis or something. We also got to go to a rodeo where a friend of ours was in calf roping and steer wrestling! He got 2nd in the calf roping and 1st in steer wrestling winning $400! We got to walk around the little carnival and I almost got a fabulous carny indian fry bread but we didn't have any cash. Anyways, I'm going to a Halloween party tonight without Phil because he has to study...so I'll post some pictures of that too! Have a Happy Halloween! Yay a new post!! 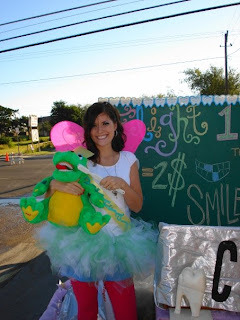 After I saw this post I told BJ I could be a tooth fairy for Halloween and he could be the Easter Bunny but he didn't think that was a very good idea! Miss you guys! i must say i love your hair dark! i miss you! i need to call you soon! so much to tell you! 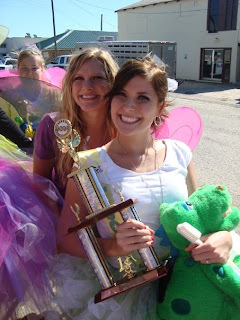 Hey at least Beeville even has a parade! 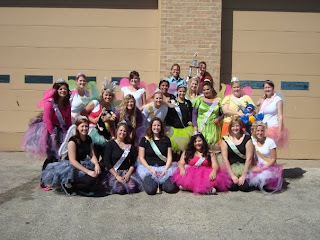 Was every one that lives in the town in the parade?! ?